The Cohen Media Group is bringing to life rediscovered classic films on Blu-ray and DVD. One such film that has been overlooked for far too long is the 1942 musical "Syncopation." While the film takes place between the turn of the century and World War II, the main focus of this film is the music. The movie features music from many jazz greats including Benny Goodman, Harry James and Gene Krupa, all of whom make appearances in the movie. It also stars a young Jackie Cooper and Bonita Granville in a love story that perfect for Valentine's Day. The original black & white film was restored in 2K from the 35mm film grain master which sat in the Library of Congress. On Blu-ray, the film looks as good and any modern release. Its great to flash back to a time when different forms of jazz were beginning to branch out from the different territories, specifically the Dixieland of New Orleans and the bluesy jazz of Chicago. The story follows the life of Kit (Bonita Granville) as she grows up with a love for all forms of jazz music, but the best parts are when Cooper's character sits in with the Dixieland bands and learns how to be a true trumpet player. Not only is the music wonderful, the way director William Dieterle captures the times during "the great war" and the differences between the north and south states. The Blu-ray is a must to own just for the bonus features alone. Along with the 89-minute version of the movie, you also get nine short jazz films from the likes of Duke Ellington, Billie Holiday, Bessie Smith and Louis Armstrong just to name some of the great that appear on this release. The total run time of these films clocks in at over 90 minutes and showcases some of the best classic jazz in music history. Any true jazz fan, or music fan for that matter, will appreciate this latest release from the Cohen Film Collection. 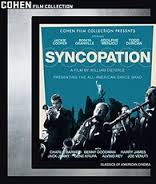 To find out more about the new release of "Syncopation" on Blu-ray and DVD, please visit cohenmedia.net.